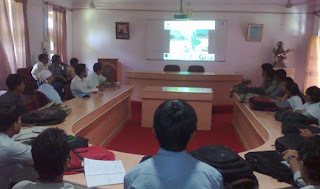 GICE Computer education organized a workshop on Google Sketch-up Software today at the Vidhya Bhawan Polytechnic College. The workshop was led by Anil Mehta, Principal of the college. Explaining about the software in detail, Gajendra Malviya, Director of GICE computer education said, “Many 3D projects such as flyover infrastructure projects, township planning, road networks, 3d virtual city view etc are developed with the help of this software. 3D models of world famous monuments and buildings like the Taj Mahal, Gateway of India, Hanging tower of Pisa, Lotus temple, Parliament of India, Charminar of Hyderabad, have been made with the help of this software and all these can be seen on Google Earth”. Malviya further added, “GICE will soon load the 3D models of Fatehsagar Pal and Sukhadia Circle on Google earth. In this software we can import the layout plan from the AutoCAD software which helps in preparing exterior and interior designs as per the user’s choice”. Students from Civil, Architect, IT and Computer science divisions were detailed about the possibilities of employment through Google sketch-up software by Subhash Joshi from GIMS (Gio Information and Modeling Solutions Pvt. Ltd, Bangalore) and Lokesh Gorana, Senior faculty, GICE. The workshop was governed by Jaykant Dave, HOD, Civil Department and the HOD, Department of Electronics of Vidhya Bhawan Polytechnic College.